Hi there! Patrick here again. For those of you just tuning in, I lead the design of our products at Tortuga. In the 2 years since I joined Tortuga, we’ve begun work on 4 product collections designed around different types of people, taking different types of trips. The Outbreaker is for for cultural explorers on international trips of a week or more. 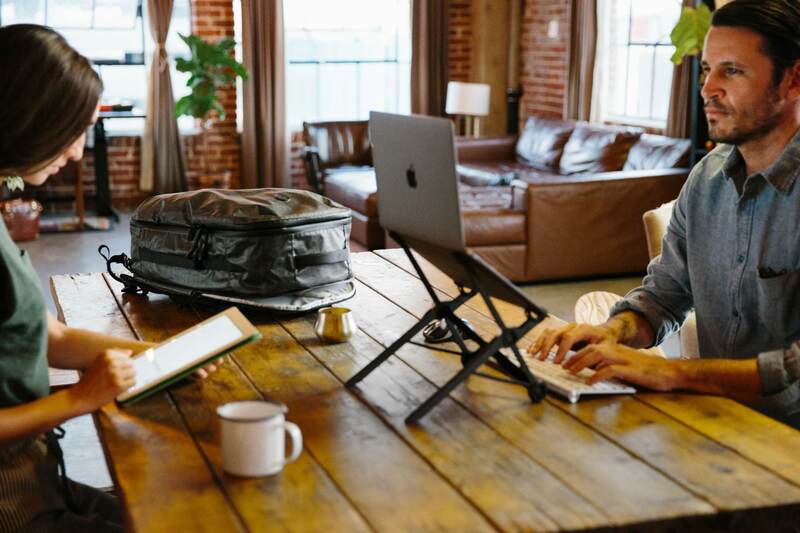 Our newest collection, the Homebase, is an ideal solution for digital nomads and ultralight travelers. The next two… well you’ll just have to wait and see. We treat each project like a science experiment. First, we gather information, then form a hypothesis, and finally we test it. We test dozens of prototypes for each product we sell and strive for variety. If we only test slight variations on a design, we won’t learn very much. If we test a wide variety of solutions, we may discover something unexpected. That’s what we hope for. 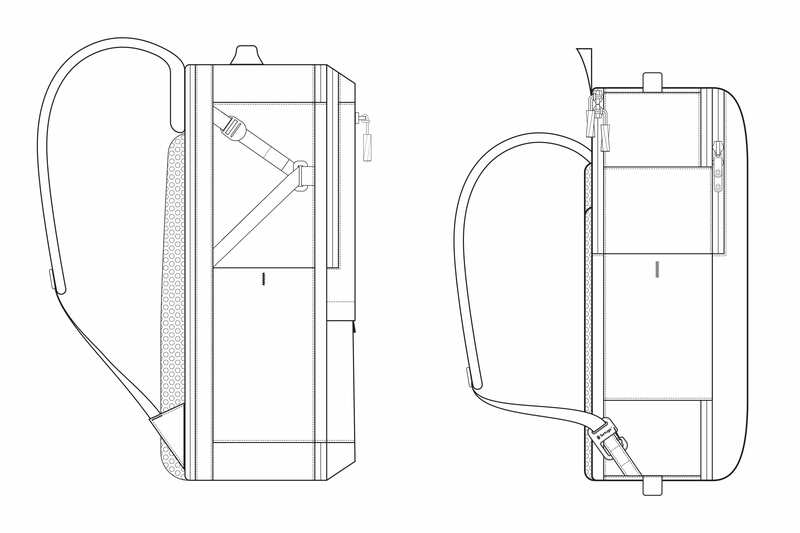 Having experimented with dozens of shapes, openings, and layouts for our backpacks, we find ourselves coming back to the same basic format each time. In our opinion, this format offers the best balance of functionality and aesthetics for the problems we are trying to solve. Below, I’ll explain why we’ve chosen these shapes, openings, and layouts for our products. I’ll discuss some alternative solutions and explain the differences between the Outbreaker and Homebase collections. We understand that our solutions may not be right for everyone. They are right for us. The Outbreaker collection of bags is very rectangular. We believe this shape is one of the Outbreaker’s biggest assets; a solution derived from the external constraints of air travel. Airlines set luggage size requirements based on linear dimensions, not volume. Packing for a trip is hard, especially if you don’t travel often. It involves weighing the pros and cons of each item. Determining which items are essential and which items can be left behind is about as much fun as getting a root canal. Deciding what to pack is hard enough. Your bag shouldn’t make packing any harder, but most do. The standard carry on size for most domestic airlines is 9” deep, 14” wide and 22” tall. These measurements create an imaginary rectangular prism that your carry on luggage must fit within. If your bag fits within in this envelope, you should be allowed to carry it on the plane. If it doesn’t you may be required to check your luggage at the gate. If your goal is to maximize the amount of stuff you can bring with you, your bag should be as close to a 9”x14”x22” rectangle as possible. Designing our bag to optimize usability has at least one major unintended consequence. This pursuit of optimization means that the sides of our bag must be straight. You want a bag with the biggest opening possible. Ideally, that opening would be like a funnel. The opening should be as big or bigger than the compartment it is allowing you to access. A truly funnel-like opening would be a little weird, strange to carry, and stranger to look at. Straight sides are our compromise. We know we sacrifice a little bit of elegance by making this decision, but we’d rather that your bag be awesome to use than just awesome to look at. Our imaginary rectangular prism is approximately 45L, but not all 45L bags are created equal. Adding beautiful curves and organizational features to your rectangle decreases its volume. Most bags that are marketed as 45L carry on bags are either not 45L or are not actually carry on compliant. Curves are beautiful, comfortable, and human. Adding curves to your bag reduces the amount you can carry on with you. Humans are really bad at visualizing volume. Remember those Youtube videos showing how much we are getting ripped off when we buy drinks at sporting events? A tall, skinny beer feels way bigger than that short, fat beer. In reality, the cups are virtually the same size. The lesson? It is harder for us to gauge what will fit into a complex shape than a simple shape. Your bag should have a simple shape to make packing and unpacking easier. The hard part of packing should be choosing what to bring, not fighting with your bag to see how much will fit. The goal of the Outbreaker backpacks is to maximize the amount you can bring on your adventures without checking a bag. As a result, the bag is very, very square. This allows you to maximize your carrying capacity while meeting airline requirements. The Homebase collection is different. People who use this bag travel light. They don’t need to use all of the space that an airline offers, so they aren’t bound by an imaginary rectangular prism. This allowed us to soften the rigid rectangle of the Outbreaker backpack, creating a hyperellipse that is more human. Both bags are simple, packable shapes that make it easy to figure out what will fit inside. How Should A Travel Backpack Open? A well-designed opening will allow you to easily pack and unpack. A poorly designed opening makes packing a chore and taking full advantage of the volume your bag has to offer difficult. Also, it can make organizing your belongings harder, throwing off your weight distribution. If a bag is hard to pack and your stuff is hard to get to, you probably won’t like it. If your bag is easy to pack and you can easily access all of your stuff in a crowded TSA security line, you probably will like it. We’ve extensively tested both the size and location of our bag’s primary opening. Time and time again, we’ve come back to the same solution: a widemouth, clamshell opening with the zipper located on the front of the bag, away from your back. An opening near the front of the bag is the easiest to pack. When you lay your bag down on its back, the sides of the bag should stand up nicely. This makes determining how much you can fit into the bag much, much easier. Now that we know where the opening should be located, we need to think about how the bag should open. In our case, we try to make the opening of the bag as large as possible. This “clamshell” style opening makes it as easy as possible to pack and unpack your bag. 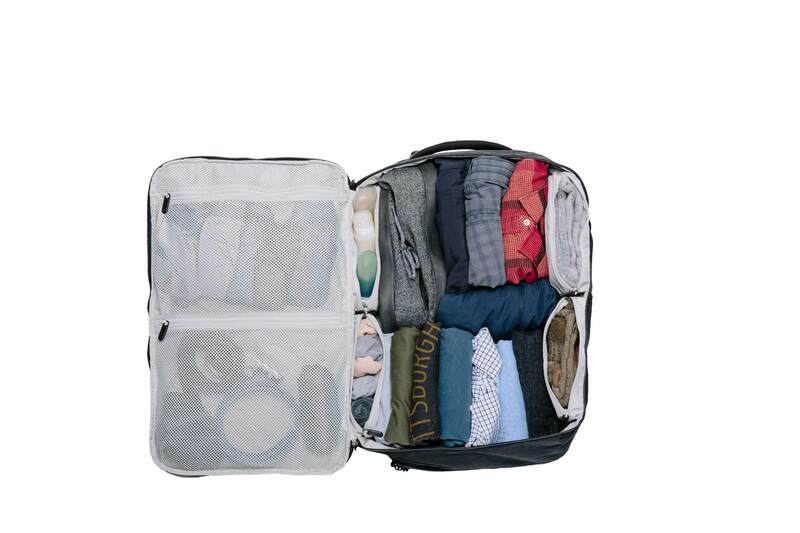 Visually, seeing the entire compartment makes developing your packing strategy much easier. You don’t have to guess what will or will not work inside of your bag because you can clearly see what will fit. We’ve tried putting the opening in the middle, like most suitcases, which divides your bag into two compartments instead of one. This makes packing and unpacking your bag more difficult. Unless you are really careful when you pack, you’ll throw off the weight distribution of this kind of bag. With a bag as big as the Outbreaker, that could mean falling over every time someone bumps into you at the airport. We’ve tried to put the opening closer to your back. In some ways, this seems like an ideal solution. It feels safer. It gives us much more freedom from a design standpoint. Unfortunately, it just doesn’t work very well. The back of the bag is the heaviest part. A bag that is designed in this way will collapse under it’s own weight when you open it. This makes gauging how much will fit into the bag much more difficult. In this case, designers are choosing to prioritize looks over usability. I’d rather spend my time enjoying the trip than figuring out how to pack my bag. A large opening also makes your bag much more flexible. Think of your old cylindrical gym bag with its straight zipper running across the top of your bag. Remember how you had to pack the biggest, most rigid items first because there was just no way they would fit in at the end? Remember how hard it was to make the most of your bag’s volume because you couldn’t see or reach your bag’s darkest corners? A clamshell opening eliminates these issues. 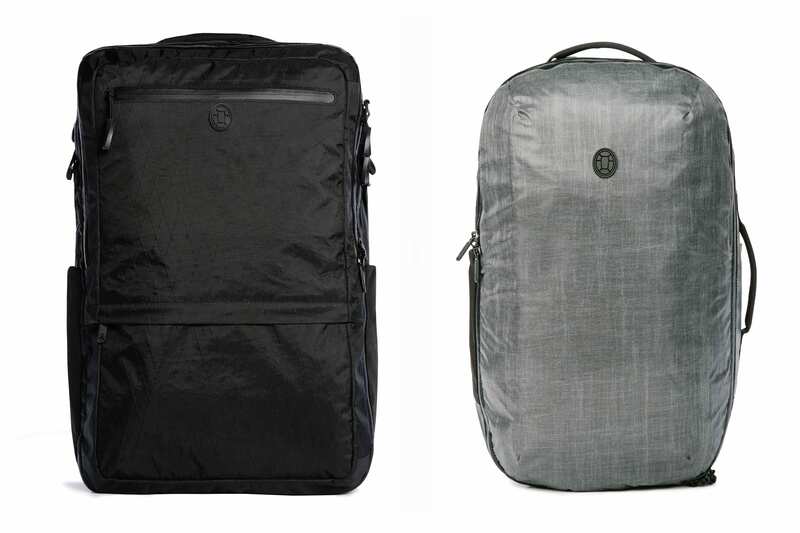 The Outbreaker backpack is primarily designed for transit. This bag will get you to your adventure, but will probably not accompany you on it. You’ll have a daypack for that. The Outbreaker’s goal is to make moving from place to place as easy as possible. It’s primarily packed while sitting on a bed or a luggage stand. The hinge on the Outbreaker’s clamshell opening is on the left side of the bag. This location makes packing as easy as possible. If you are packing on a bed, you’ll still have space on the surface to put everything else. If you’re packing on a luggage stand, the lid of your bag can lean against the wall. The things you store in the lid and accessories compartment won’t fall onto the ground while you’re trying to pack. 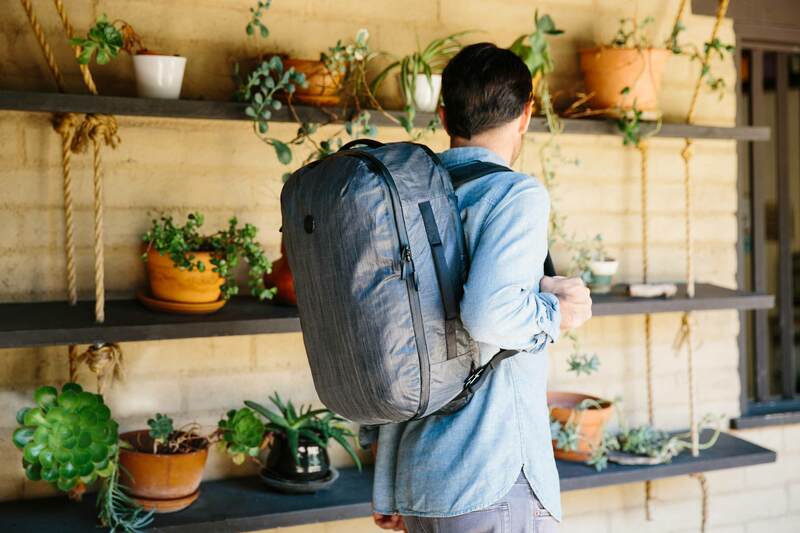 The Homebase backpack is designed to seamlessly move between transit, work, and exploration. It will be the bag you carry on the plane, to your coworking space, and on your adventures through the city. The main opening hinges on the bottom of the bag. When you are working or exploring a new city, you want to be able to get into the bag from the top. You want to be able to completely remove your bag’s contents without fearing that everything you own is about to fall into a wet, dirty, city street. Locating the hinge on the bottom of the bag provides that security. How Should A Travel Backpack Be Divided? It would be easy to imagine that the bag I’m describing is a big rectangular cavern. A bottomless pit with no internal or external organization. That couldn’t be farther from the truth. We strive to find the right amount of organization for each bag that we produce. We seek to balance functionality with versatility. In designing our last four collections, we’ve explored an even broader range of organizational solutions. We’ve considered shoving everything into one big space. We’ve tried to combine the laptop and accessories compartments. We’ve explored adding a shoe compartment or dividing the clothing compartment in two. Each time we develop a new product, we start from the ground up. Each time, we settle on a three compartment solution. It would be easy so assume that we leapt to this 3 compartment solution. That isn’t the case. 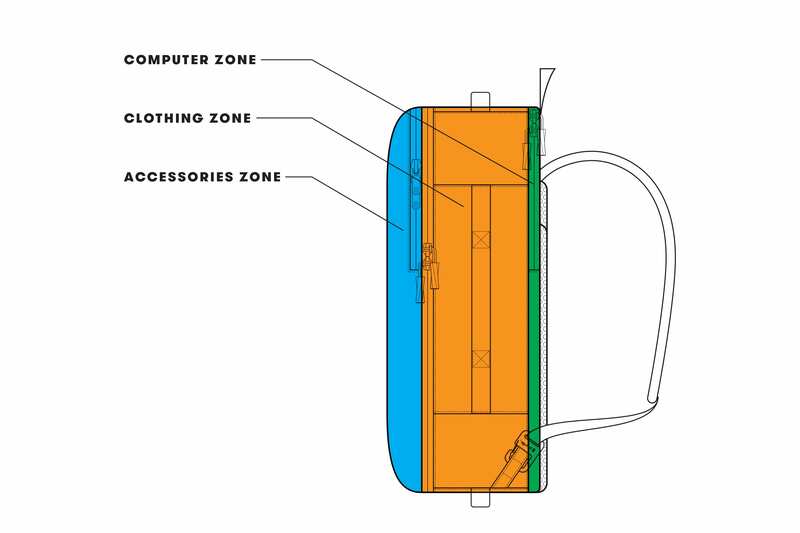 Each iteration of the 45L Tortuga backpack has leveraged a different organizational solution. The V1 had 4 large compartments. The V2 had 2 compartments. Both had significant problems. We’ve probably tried every option you can imagine. Time and time again, we come back to these 3 compartments. In our opinion, three compartments provides the best blend of packability, on-the-go access, weight distribution, and organization. It may not be the right solution for everyone, but for now, for us, it’s the best solution. We aren’t just indiscriminately chopping when we create a three compartment bag. We are creating an organizational system based on our travel behavior. Each zone serves a specific function. On the back, we have a compartment for our laptops and other slim technological devices. On the front, we have a compartment for our headphones, snacks, passports and all of the other little things we need to get to in a hurry. Sandwiched in the middle is the space for your clothing and everything else you’re bringing with you. We find that this layout simply works better than anything else and hits the perfect balance between flexibility and organization. 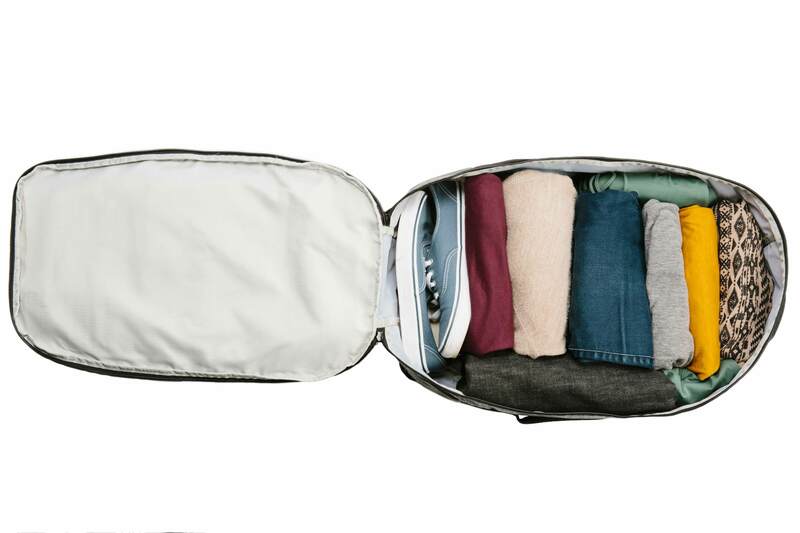 One big compartment is great for flexibility, allowing you to organize your bag in any way that you see fit. When you have one primary compartment, on-the-go access to your belongings is just too hard. We’ve played around with the idea of two pockets. One pocket for everything you need in transit. A second for everything else. Conceptually, it’s a great balance between organization and flexibility. In practice, it just doesn’t work well. If your bag isn’t completely full, you end up with an odd weight distribution. When your luggage is overflowing, some of the things you need are just too hard to get to. When you go beyond three zones, you create an entirely different set of problems. The bag becomes too prescriptive, forcing you into a tiny little box. If you don’t carry the exact things the bag’s designer envisioned, the bag becomes unusable. Even if you find a way to repurpose every pocket, those extra divisions come at a price. Every feature you add to a bag takes away potential volume and reduces flexibility. What happens if, for some reason, you want to put something really big or oddly shaped, like, I don’t know, a yoga mat, inside your bag? You can’t do it. The added organization makes doing so impossible. The Outbreaker is what my old design professor would call a “tour de force.” The goal is to maximize the amount of organization the bag provides. Within each zone are countless divisions. Some are external, like the zippered pockets on the front of the bag. Others are internal, like the 6 pockets within the clothing compartment, allowing you to separate your underwear from your socks. Your clean clothes from your dirty. These pockets give you a specific place to store everything you are bringing with you. That organization comes at a cost. Each new pocket adds weight. Internal pockets increase the time it takes to access every item inside of the bag. If your socks are in one of the Outbreaker’s internal compartments, you have to open two zippers to get a fresh pair. Additional organizational features also dictate how you can use your bag. For some, these costs are worth it. For others they are not. That’s why we took a different route with the Homebase backpack. We stripped away all but the most essential organizational features. This allowed us to create a robust, durable bag that weighs just over 2 lbs. With the included packing cube, you can go from transit to adventure in under 30 seconds. If the packing cube doesn’t work for you, you can take it out and reorganize the internal space as you see fit. The Homebase is a lightweight, versatile, and efficient solution for ultralight travelers who want the freedom to mold the bag to fit their unique needs. We realize that not everyone has the same travel preferences or requirements. We see that every time we travel together as a team. When Jenn travels to the Middle East, she sometimes lugs around a Burka for the entire trip. It takes up a lot of space. It is easier for Angela to fit 5 days worth of clothing into a bag than it is for Jeremy. Jeremy is a significantly larger human being than Angela so each article of Jeremy’s clothing takes up more space. What I consider to be essential for a week long trip is dramatically different than what Taylor considers essential. That’s OK. Different people and different circumstances create different luggage needs. We’ve been making travel backpacks for the last 7 years. Each choice we’ve made for our bags is the result of careful study, user experience research, and on the ground testing. We are committed to continuing to learn and improve our process and our luggage. When we get something wrong, we fix it. When we do something right, we challenge our assumptions. Our current bags represent the culmination of our singular focus on designing the best backpacks for air travel. We plan to build on this knowledge base. We will make our carry on bags even better and apply our knowledge to help you maximize every travel experience. Every collection is a new adventure. We hope you join us on ours. We plan to keep making yours even better.